Masterbox keep churning them out don’t they? 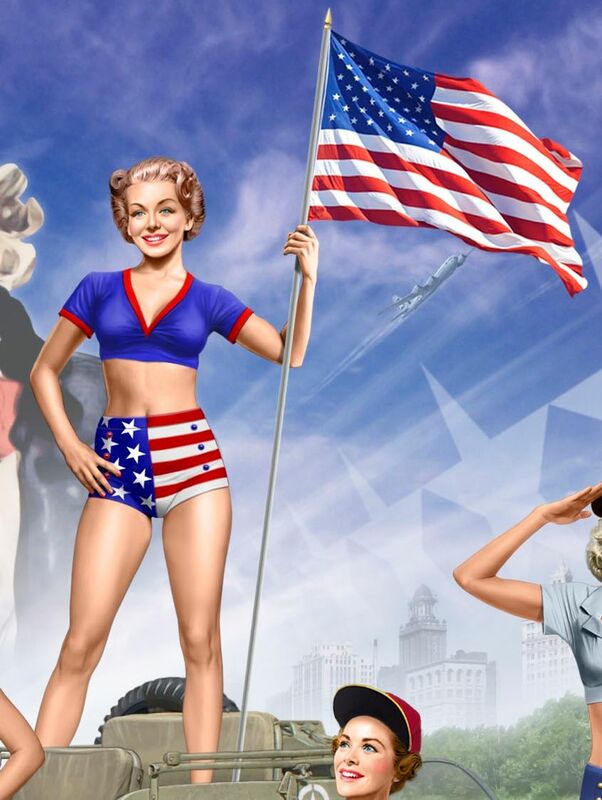 And in keeping with their rather successful German Paratroopers & US Infantrymen kit doing a peeping tom act they go all USO on us with their spectacular new release featuring what looks like Girls of the USO tour? It looks like the navy, airforce and army are covered in this release – Like this type of figure set or not we are sure just with the amount of interest some of Masterbox’ kits like this receive this WILL be popular. 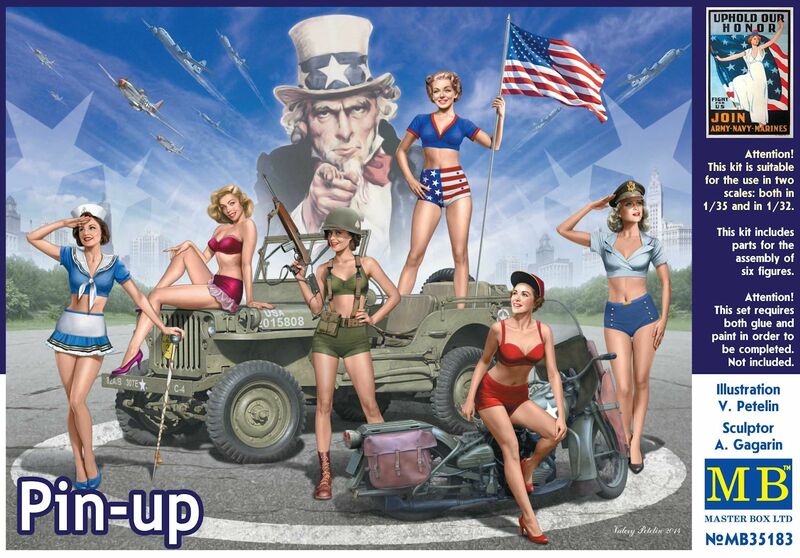 “Pin-up” – the kit consists of six figures of girls performed in legendary “pin-up” style. We would like to emphasize that this style is rather popular nowadays too, moreover, exactly now the interest to this style returns, and the presence of such number of figures of girls in the kit is an excellent present for modellers, as it allows stepping aside from traditional stories for dioramas and creating of something original. 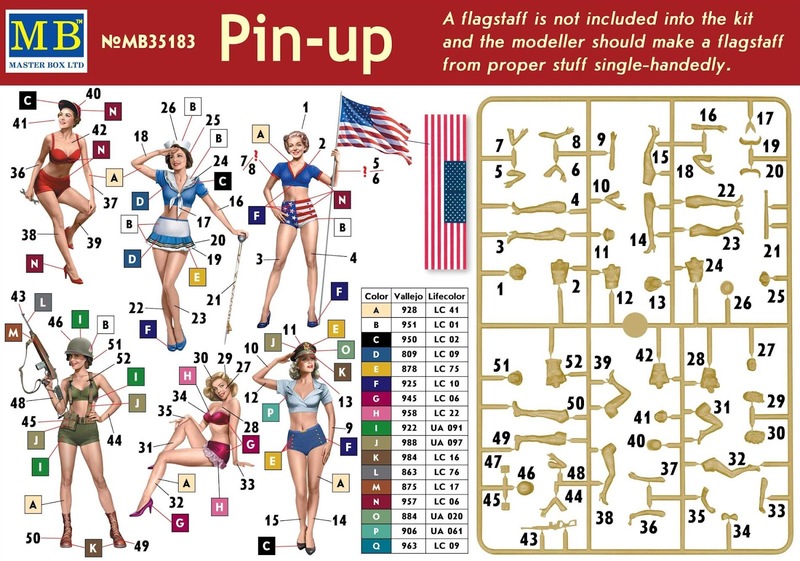 We would like to pay attention especially to the scale in that the kit is made: scale height of girls allows using of these figures both in 1/35 and in 1/32 scale with every reason, as six figures of girls, not interconnected by a general story line open up a lot of opportunities for the modeller and allow to decorate a wide range of the models from ground military or civil equipment to models of aircraft. 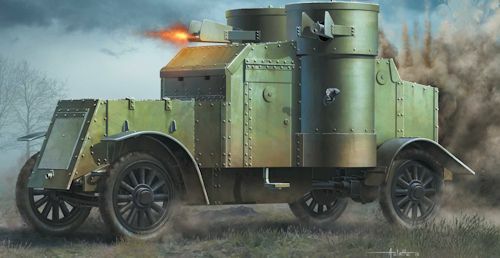 With this kit the modeller receives an opportunity to create 6 different dioramas at own liking and to use figures both together with models of the most various equipment of different manufacturers and as an independent sculpture. 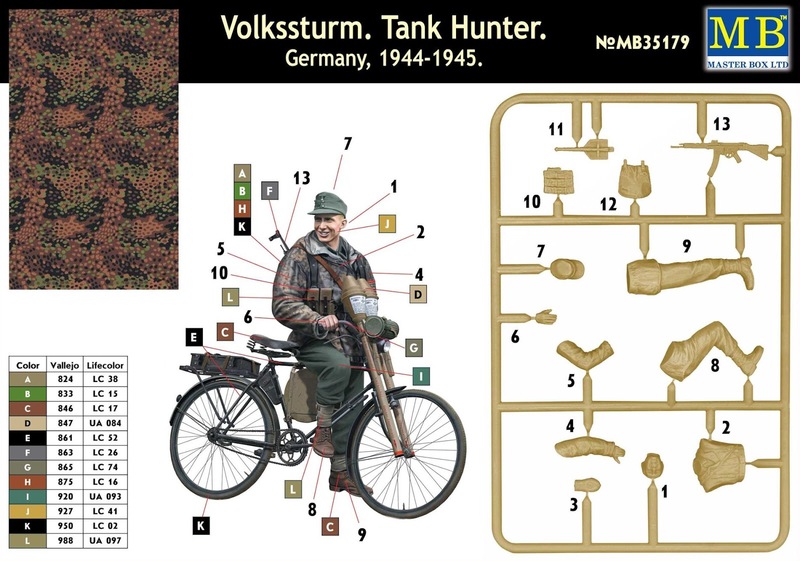 The kit consists of two sprues and the photo-etched plate that allow to assemble the figure of German teenage male bicyclist who is ready to fight with the tanks of Russians in Berlin. 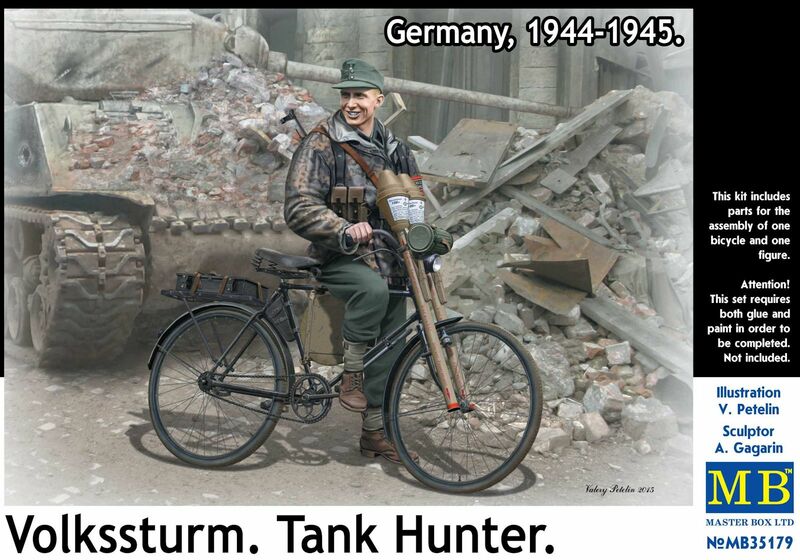 Despite the simplicity of the kit the story and figure is rather dramatic and emotionally filled, as it reflects the tragedy of the last months of fights in the territory of Germany. 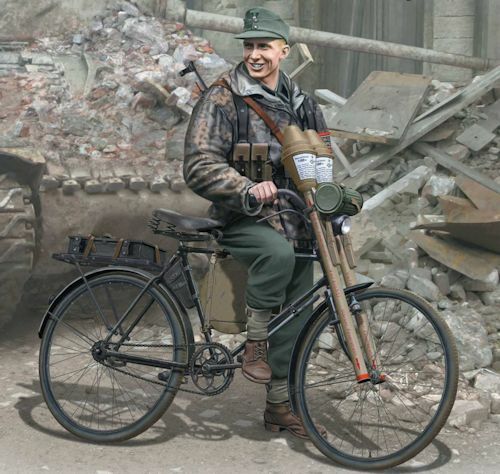 The kit is detailed richly, and the parts for assembly of the bicycle allow creating of the model of museum level. 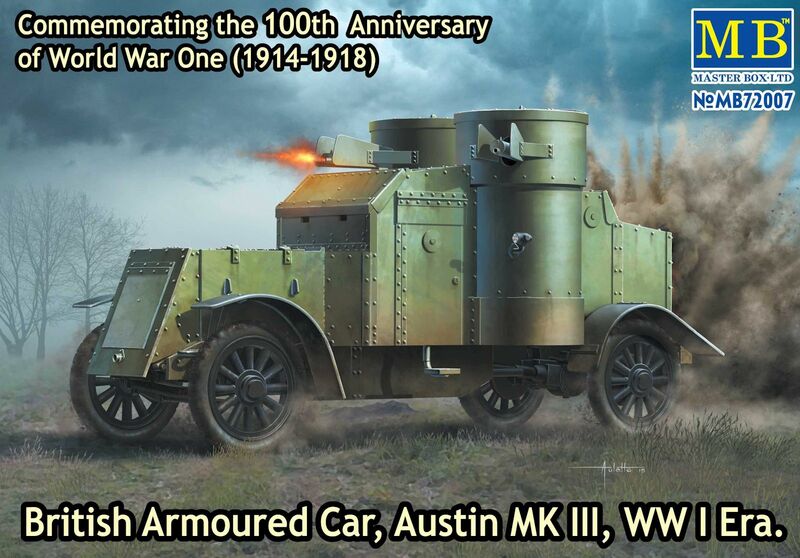 "British Armoured Car, Austin, MK III, WW I Era"
This kit is part of the centenary celebrations for WWI – on the box is inscribed "Commemorating the 100th Anniversary of World War One (1914-1918)". 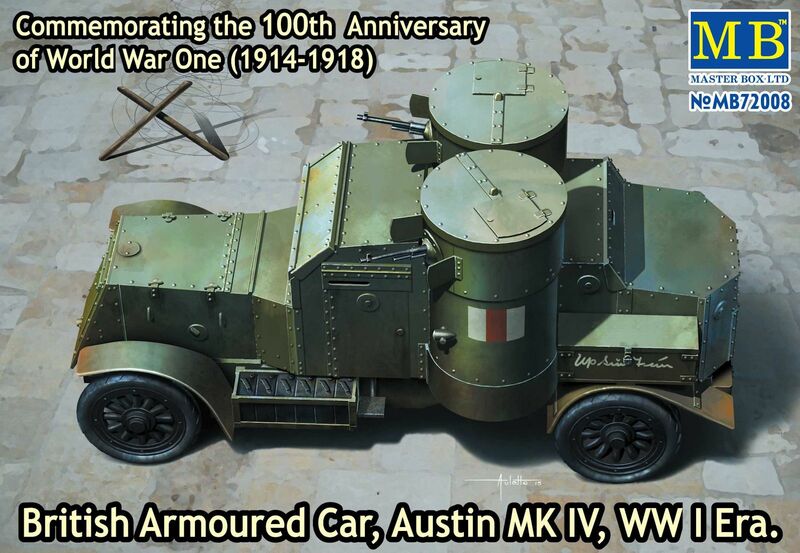 The kit consists of two sprues with parts that allow to assemble the model of the Austin, MK III armoured car of WW I Era. 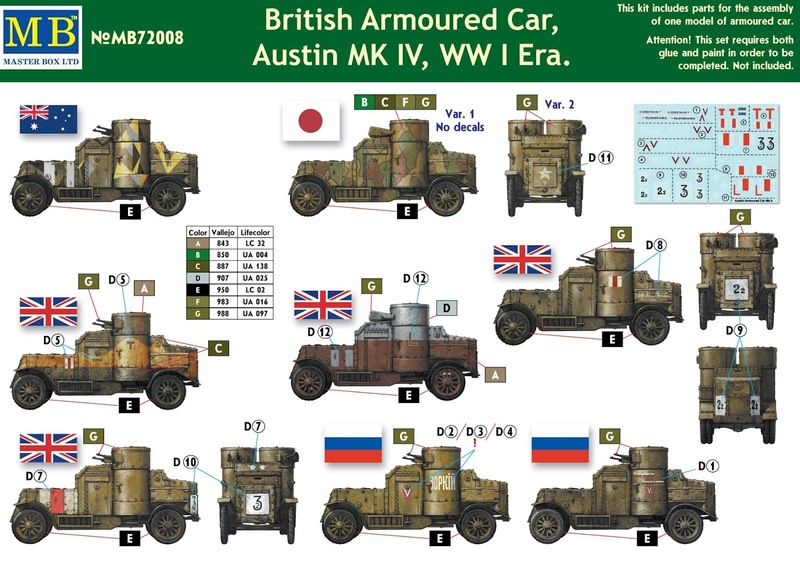 The decal allows assembling of the model of the armoured car on service of the armies of several different countries. 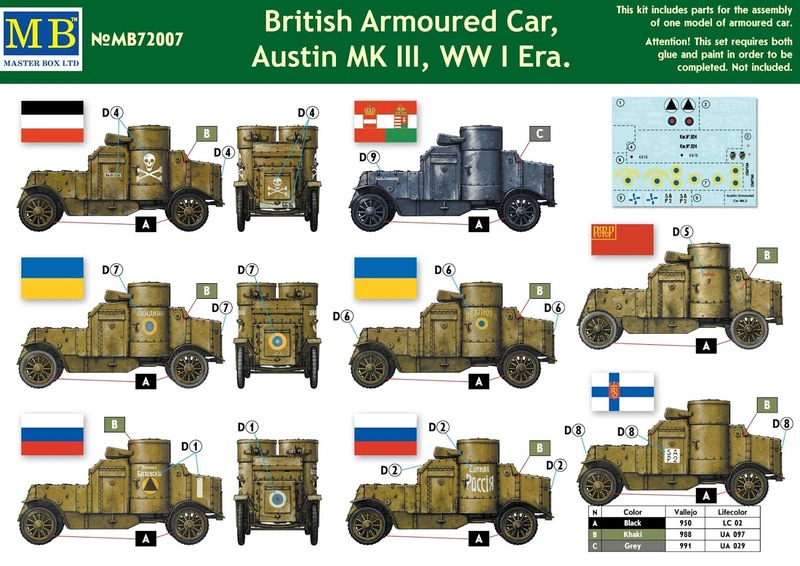 "British Armoured Car, Austin, MK IV, WW I Era"
The kit consists of two sprues in grey with parts that allow to assemble the model of the Austin, MK IV armoured car of WW I Era in different variants – both with different systems of armament (Vickers, Lewis machine-guns or mix of these systems at modeller’s choice) or with a different chassis. 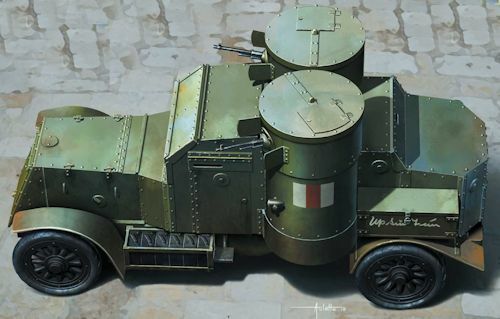 Masterbox wanted to emphasize that in this case tyre tread of the model has a different design that will create a desire of the modeller to buy one more model and to make another variant.